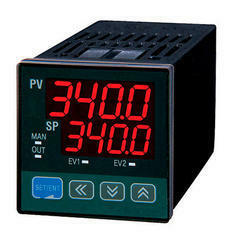 - ELEKTRA II is a Blind Temperature Controller with a single Thermocouple or RTD input and 1 relay output with user-specified control action and relay logic. - Range : 0 to 250/400/600/1200°C /J (Fe-con)/ K (Cr-Al) Deviation indication/Potentiometric setting. COLD JUNCTION COMPENSATION: Automatic from 0 to 70°C. 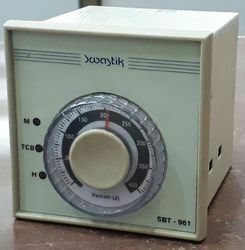 We are a supplier, and importer of the Selec Blind Temperature Controller in India. We supply and stock of model TC52-400-J-230. Owing to the wide experience in this domain, we are instrumental in offering Blind Temperature Controller to our clients. Being a leading firm in this industry, we are manufacturing a high quality range of Blind Temperature Controller. According to the requirements of our customers, we are indulged in providing a quality assured range of Blind Temperature Controller to clients. This Blind Temperature Controller is easy to install and compact in design. Moreover, these products are precisely examined for quality to ensure their flawlessness. We are listed amongst the top firms of the market engaged in offering a large collection of Blind Controller to the clients. These products are cost effective.